Many Western nationalists ask: why are Ukrainian nationalists fighting only the mercenaries in eastern Ukraine, and not the current liberal Ukrainian government? 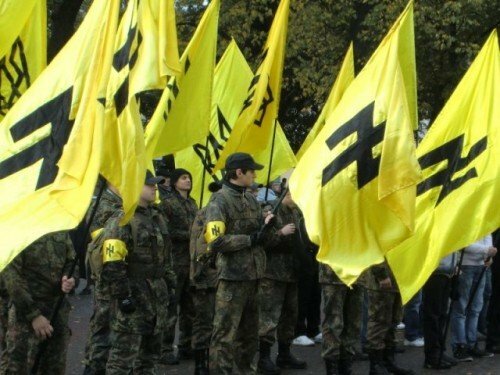 In general, there are two Ukrainian nationalist movements or organizations that exist at the moment: the Svoboda party and the Right Sector movement. Unfortunately, at the moment a huge amount of friction and mutual hate exists between them. However, thankfully, at the lowest levels people from both organizations work together very closely. The Svoboda party has existed in different forms since around 1991. In 2012, it won around 10% of votes to the Ukrainian parliament. At the end of 2012, it won the “honor” of having two of its leaders listed by the Simon Wiesenthal center among the ten biggest “anti-Semites©”in the world. The program of the party is by far the most radical, anti-capitalist, anti-liberal program of any major organization that exists in Europe. It contains ideas such as banning usury, creating a Ukrainian computer operating system to be used on the territory of Ukraine instead of Microsoft Windows, essentially severely restricting any foreign news and information in Ukraine, banning homosexual propaganda, banning the advertisement of alcohol and cigarettes (with later attempts to ban them all together), forbidding anyone who is not Ukrainian by ethnicity to obtain Ukrainian citizenship, having the state promoting Christianity. There are also many points regarding nationalization of industry and business, returning Ukraine’s nuclear status, banning “Ukrainophobic” parties and many other great initiatives. Svoboda’s program is a mix of every positive element of classical Strasserism and modern nationalism. During the 2012 elections, many voted for Svoboda hoping the party would fight the oligarchs — indeed, many old Communists even voted for the party due to the anti-capitalist economic program of the party. For whatever reason, this did not come true, and inside the parliament, Svoboda become relatively pacifistic. This disappointed many, but Svoboda continued (and continues) to conduct many initiatives for youth and other members, especially patriotic camps where people can play sports, learn to use weapons, and so forth. During the 2013–2014 protests, Svoboda played a huge rule and much of this training came to use — it was Svoboda that essentially controlled most buildings captured and made them quite safe, pleasant, and orderly places to be. It was Svoboda that did all it could at these buildings to spread nationalism — whether through conducting lectures, welcoming foreign nationalists, or showing films. It was Svoboda that paid to maintain these buildings and to maintain many of the biggest stages. Yet, many become very disappointed with the position of Svoboda during many aspects of the protests — Svoboda constantly warned its members against violence on the streets and around January essentially took a position that it would not be possible to overthrow Yanukovych, opting instead for favoring negotiations. This, along with the calls of Svoboda throughout the protests to abstain from violence, essentially led to the rise of the Right Sector that became filled with people disappointed with Svoboda. The Right Sector is an umbrella group covering numerous smaller nationalist organizations that existed long prior. These organizations range from being more Christian than nationalist in nature to being radical nationalists. From the very beginning, the Right Sector positioned itself as a direct alternative to Svoboda. Ideologically, in terms of economics and so forth, the movements are essentially identical. The leader of the Right Sector, Dmytro Yarosh, was earlier the leader of the Tryzub organization — a Christian nationalist organization that has existed since the early 1990s. One key thing to understand about Ukraine is that the country resembles Western countries in the 1970s — where there was still a general solidarity amongst members of the nation, both in spirit and in blood. No one cares if you say you are “nationalist” — there is basically no stigma whatsoever. This is both good and bad. It is good because nationalists essentially have access to media, government, and so forth at a level that would be unthinkable in the West. It is bad because to the average person, it is not clear who is really a nationalist who wants to defend the Ukrainian nation, and who is a liberal who wants to sell the country out to international corporations. No one is openly a liberal in Ukraine. It is all done behind the scenes. Elites are preparing for Ukraine for a future as part of Western Europe — yet they do it all in secret, hidden from the public eye. And they’ll deny it publically. In both cases, no controversy at all ensued. In reality, these are exceptions — a way of wearing a mask — but they are not the policies of the party. The party is filled with liberal, Western agents. But the average person doesn’t know this, and thus, many even nationalists will support this party. Similar things can be said of other parties that are viewed as being pro-Western in Ukraine. They are pro-Western in reality, but they are viewed by the average citizen, through successful manipulation, as actually being pro-Ukrainian and even patriotic. It is hard for nationalists to differentiate themselves from these parties without seeming insane to most people. This is a problem. There has, of course, been a lot of animosity between nationalists and the current government, whether it was nationalists on their way to defend a pro-Ukrainian demonstration being brutally attacked on orders of the government, or the recent brawl between nationalists and pro-government security forces on the Maidan. After news of the elections results, nationalist groups on social-media sites erupted in rage against the new president. But at the moment, the fact of the matter is that a foreign force has invaded Ukraine. This is not a civil war. It is viewed by virtually everyone in Ukraine as a Russian invasion. If one asks why nationalists are not fighting the government, they should ask why British, Polish, French and so forth nationalists did not fight their governments when their countries were at war with National Socialist Germany — especially since National Socialist Germany truly presented, at least to a large extent, an ethnic nationalist alternative and was not a typical liberal democracy like the modern Russian Federation. Were British, Polish and French nationalists, as certain “intellectuals” might say, “American agents, working for Atlanticism”? In fact, the biggest resistance to the mercenaries in eastern Ukraine is not organized by the state itself, but by networks of Ukrainian patriots — patriots inside the army, inside the police, doctors, workers, and nationalist movements on the ground. There is, just like on the Maidan, an incredible amount of civil organization amongst the ordinary people. It is, in effect, a people’s war; it is genuinely the Ukrainian people that are resisting the Kremlin, and trying to save the very idea of a Ukrainian state. The modern Ukrainian state largely exists to defend the interests of the oligarchs, not the interests of Ukrainians, and it has little interest in a full scale operation that would cost millions of dollars. The real question is why the Russian Federation — a superpower with trillions of dollars of resources and one of the most sophisticated networks of spies in the world — is fighting Ukrainian nationalists. Why has the Russian Federation done absolutely nothing to stop the spread of Western liberalism in Ukraine, financing only movements that fight those groups in Ukraine fighting that same liberalism? It is not possible to accept, even for a second, that Russia does not know what goes on in Ukraine. Russian state security, the FSB, and state intelligence services are among the best in the world. They are well aware of who is who in Ukraine. They are well aware that by talking about “Novorussia” (“New Russia”) (a term Putin uses for eastern Ukraine that Ukrainians view as derogatory) and by sending mercenaries into Ukraine, the overwhelming majority of the population will turn against them. Natural identity politics will work —the majority of the population of Ukraine will unite around Ukrainian national identity in face of a threat from a foreign identity. I myself run an anti-liberal website in Ukraine, a somewhat well-known website that constantly promotes opposition to the EU, NATO and so forth. When Western agents see the website, they immediately accuse us of being financed by the Russian Federation. I always think to myself — wouldn’t it be great if it was true? Everything would be so much easier! If we had 1/10000th of the money that Western agents had in Ukraine, we would already be in power. Yet we get nothing. Because we don’t want our national identity to disappear and because we oppose the Russian mercenaries, we are attacked on every front by these very same Russian agents and called everything from neo-Nazis© to American agents. And yet if only they helped us — rather than helping groups of essentially liberal individuals who cringe at any mention of Ukrainian identity — things could be so much different. Ukrainian nationalism is far from being anti-Russian. At the beginning of the 20th century, nationalists, especially those from Western Ukraine, actively wanted to work with Moscow — the same nationalists who later formed the Organization of Ukrainian Nationalists which has been incredibly demonized by the modern Kremlin. Unfortunately, they were all either ignored or mocked by Moscow and because of this, the potential for co-operation disappeared. Russia knows that the only force that actively fights liberalism and all negative tendencies associated with it in Ukraine are Ukrainian nationalists — and it most certainly has the knowledge and money to finance a Ukrainian nationalist movement by itself. Such a movement would completely take away the Ukrainian identity factor that is currently fighting the Russian mercenaries in Ukraine. It would also be a lot cheaper. Rather than asking why Ukrainian nationalists oppose the Russian Federation and (apparently) don’t fight Ukrainian liberals and Western agents, one should ask why the Russian Federation fights only Ukrainian nationalists and doesn’t fight Ukrainian liberals or Western agents in Ukraine. It doesn’t matter if they don’t like current nationalist movements in Ukraine — they could create a new one. But they don’t. This is the key question. Why, if Russia is truly a threat to global oligarchy, are Ukrainian nationalists the only target of Russian propaganda and not Ukrainian liberals? Can one imagine a country like Iran calling Hezbollah (which was an organization originally not loyal to Iran, until Iranian secret service installed its own people there) or Hamas “terrorists”? Can one imagine Iran financing liberal Persian speakers in the “fight against Islamic extremism,” even allowing a NATO base in its country? Of course not — because Iran is the real deal, a state outside the rule of global oligarchy. The events on the Maidan were protests by ordinary people against an incredibly corrupt pro-Western, liberal regime in Ukraine that Russia also supported and the West remained completely loyal to until the very end. The protests started not due to the government not signing an agreement with EU (despite the same government promoting the same agreement for years in all ways possible), but due to a horrendous beating of unarmed protestors in the center of Kyiv that became known to all of Ukraine. This was the final straw after years of mafia rule. The role of nationalists in this was huge — ordinary hate to the regime was turned into pro-Ukrainian, patriotic energy and the regime was seen as overtly anti-national. After the government was overthrown, the faith of average Ukrainians in the West plummeted — it appeared that a genuine anti-liberal, nationalist revolution was imminent. But then the conflict with the Russian Federation started. Rather than capitalizing on the plummeted support to the EU and NATO, in fact, the Russian Federation did all it could to convince average Ukrainians to become pro-Western again. This was done by first invading Crimea when Ukraine was in a state of anarchy and then invading eastern Ukraine. Inside the Russian Federation, any true, Orthodox and nationalist opposition to the regime has been destroyed, yet overtly liberal opposition is allowed to function without problems. Russia is essentially a false opposition to global oligarchy in general and the West more specifically. Actually, a more detailed article would discuss how the Russian Federation is a safeguard against any potential real revolutionary force — a group the elites hope nationalists follow. The war mongering of the liberal elite of the Russian Federation and its stooges amongst “conservatives” closely resemble the war mongering in the Middle East of the neo-cons in the US and their pseudo-conservative mouthpieces. It is hard to predict the future in Ukraine — it appears now that in the immediate future, liberals supported by Russia and the West will come to power and full-scale oppression against Ukrainian nationalists will commence, just like before the events in 2013–2014. The key between then and now is whether Ukraine holds onto every region of eastern Ukraine and for Ukrainian nationalists to prepare for what lies ahead. Only by defeating once and for all much of these vehemently anti-Ukrainian forces — who are typically liberal by ideology, but simply overtly opposed to any expression of Ukrainian identity — it will it be possible for Ukrainian nationalists to finally be able to fight a war on one, not two fronts. Yet who knows — recent events show that whenever Ukraine and Ukrainian nationalists have a chance to fight Western liberals one on one these same Western liberals are typically saved by the Kremlin.